The international conference on support to Syria took place in Brussels this week, with the EU’s High Representative Federica Mogherini reiterating EU support for UN-led peace efforts and continuing its efforts to bring in more money to deal with the effects of the devastating war. The EU has been largely side-lined by the big power play and proxy wars that have so decimated Syria but there are still positive steps it can take. Humanitarian response is important – and something that Europe does well. It may well be dismissed by the men with guns who create the mess but dealing with the consequences of war is crucial work, especially given the massive level of displacement in this case. In these efforts and in its support of peace processes, such as they are, the EU must continue to support the involvement of Syrians themselves at every level. 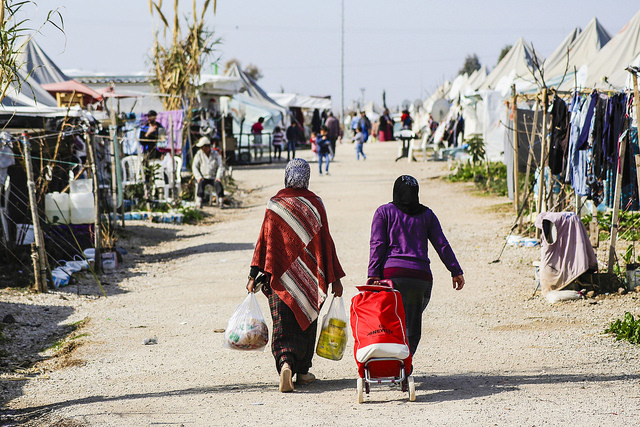 An important publication from Carnegie this week presents the views of Syrian refugees, many very pessimistic about the prospects for peace and political transition, even if the violence abates. An inclusive and just peace is more likely to last and the EU should continue with its local-level governance and peace efforts. Of all those involved in Syria, the EU and individual European countries are the only ones who will make an effort to include a wider number of Syrians – it can hardly be expected from the strongmen who repress civil society in their own countries. Still, Europe may continue to have little influence in the region: its most effective work could be at home – because for most Syrians in Europe it will now also become their home. With the continuing horrendous levels of violence, it may seem premature to talk about peace but there is the sense that a settlement is coming, with the regime’s efforts now an attempted land grab to strengthen its hand in negotiations and its ability to govern whatever is left of the country. As it remains likely that Bashar al-Assad is part of the settlement, many Syrians will not be able to return. This means four things for Europe. First, European countries need to get real and accept that displaced Syrians are here for the long-term and make a large-scale investment in inclusion of people in European societies. Inclusion comes through protection of rights of refugees – rights to employment, education, housing etc – of course accompanied by appropriate support to host communities, which is now recognised as good practice. All evidence shows the centrality of language acquisition, required investment and support for the beleaguered language teaching sector. For many Syrians, family reunion is priority given the dispersal of families across a huge region, exacerbating the pain of the war. Here, many European countries could do far more: Syrians and lawyers across Europe have to fight for a right that should be guaranteed. Acquisition of nationality is also essential to allow equality in front of the law and removal of the stigma (regrettably but undeniably) attached to the label of “refugee”. Inclusion can be built in across the EU’s next Multiannual Financial Framework. Second, the legal framework for international protection needs to reflect the highest standards of human rights; we already see the damaging impact of recent backtracking in response to the European “crisis” on refugee issues (compared to the situation in Syria, it still seems absurd that Europe experienced the arrival of people as such a crisis). For example, the use of different protection statuses that provide fewer rights – subsidiary protection without family reunion rights, temporary protection without long-term residency rights. Some countries are already, shamefully, exploring the possibility of returning people to Syria (Denmark the pioneer, of course) and the pernicious impact of “internal flight alternative” concepts in law come into play – in simple terms, classifying a country as safe because one part of it is “safe” and then returning people there, regardless of whether they have ever been there or have any connection with that region. As Carnegie’s report shows, many Syrians of course want eventually to return but are rightly deeply fearful even in the medium term. Despite the general, naïve, belief that inhumane return policies are the answer to Europe’s “problem” this should be out of the question. It will only cause distress – further hindering inclusion as people hang in limbo – and protracted legal battles that states are likely to lose. But we shouldn’t have to rely on judges to step in to prevent violations of the human rights of refugees – the legal framework should reflect this from the beginning. Third, what happens in Syria will be about justice as much as about peace and many justice processes will play out in Europe. The United Nations International Impartial Independent Mechanism for Syria (the IIIM) begins its important work in preserving, collecting and collating evidence of international crimes, using criminal law evidential standards. Prosecution may then follow, in European courts exercising universal jurisdiction or potential future international tribunals. The IIIM is reaching out to Syrians and will continue to do so. Syrians in Europe continue to work together on tentative reconciliation efforts. Europe can play a backseat role fostering, funding and facilitating if useful. If it is to be involved in post-conflict efforts in Syria it has to build justice into everything it does. It can put its funding and political leverage into these efforts rather than detention and deportation. In all the international political and legal processes, European NGOs have a role to play in ceding access to Syrians – advocates, activists, organisations – and better including refugees across their work. Fourth, European countries should expand their efforts to allow refugees to reach Europe safely (in addition to expanded family reunion). The numbers may remain too low but there are positive developments: 22 of the 28 Member States have some programme that offers a pathway to Europe, be it resettlement, humanitarian corridor, private sponsorship or student scholarships. With so many millions, including many vulnerable people, still in camps or in fragile situations in other regions, the need is there. Perhaps what Europe needs above all is foresighted leadership that views this situation as an opportunity – and speaks out against rising xenophobia. Europe has a duty to support refugees leaving Syria (and from anywhere else) but it is also in Europe’s interest to absorb new populations. It is more than feasible to manage a successful inclusion in Europe of those displaced by the war in Syria, and in a way that is also of great benefit to Europe. Continuing to tolerate or generate a hostile environment for refugees in Europe will just compound the tragedy.